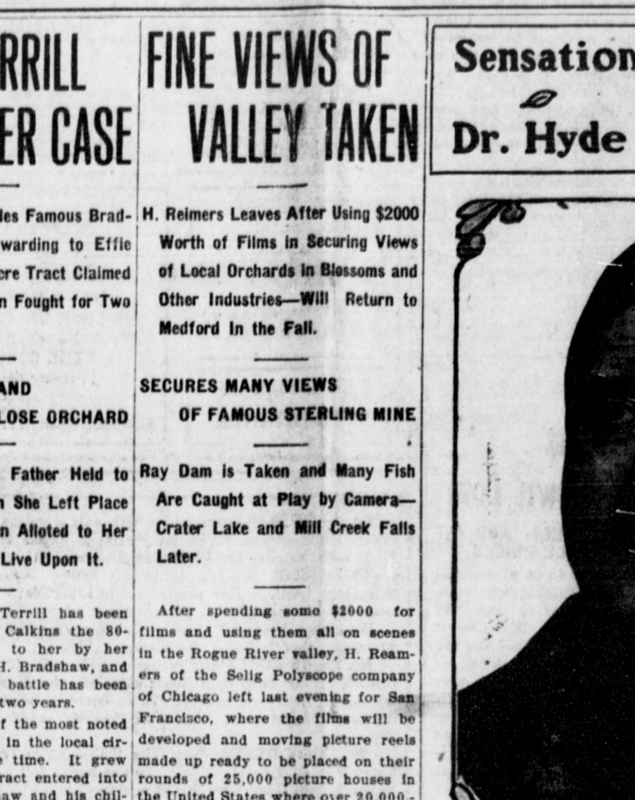 In the April 11, 1910 edition of the Medford Mail Tribune, an article was written about the filmmaker H. Riemers and his tour of Oregon. He filmed several scenic views of Oregon, including landmarks such as Table Rock and Sterling Mine as well as local orchards and farmland. Riemers’ future plans were also added, saying that he was going to film Crater Lake and other natural features. The films were said to have cost upwards of $2000, and according to the United States Bureau of Labor Statistics’ CPI inflation calculator today that would be $50,929. This is no insignificant amount of money to spend on films just featuring a state’s natural and man-made wonders, so there must have been a reason. 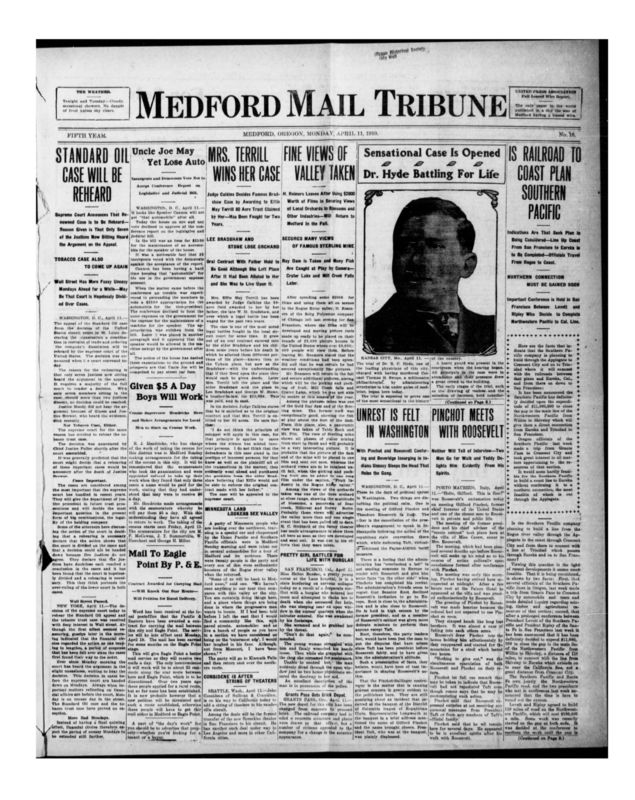 The last paragraph of the article states that Medford’s own E. C. Hubbard, owner of the Savoy Theater, was responsible (at least in part) for the creation of these local Oregon films. Theater owners and exhibitioners are responsible for providing their audiences with content that they want to see, and in supporting Riemers’ work Hubbard is providing what the moviegoers of Medford want. Much like the spectacle of the Lumière Brothers’ film La Sortie de l’Usine Lumière à Lyon (1895), the people of Medford found it pleasurable to see places and possibly even people that they recognized on screen, if the large investment placed in these films is anything to go by. Another interesting aspect of this article is that the films, after being compiled in San Francisco, were to be distributed to several thousand “picture houses” across the country and made available to millions of spectators. Oregon at that time was the mostly untamed frontier, an exotic place filled with wildlife and raw natural beauty. Through these films, people on the East Coast would be able to catch glimpses of a place that they would normally never get to see. United States, Congress, Bureau of Labor Statistics. “CPI Inflation Calculator.” CPI Inflation Calculator, United States Government. www.bls.gov/data/inflation_calculator.htm.